The cephalothorax and opisthosoma green-brown, the latter tinged with red and the pedipalps red-brown; length of body: 1.5–1.7 mm. Distribution: NW. Europe: S. Sweden, Denmark, NW. Germany, Belgium, Italy, Ireland, NW. France, N. Spain and Madeira. In Britain it is common in the south and more local in the north and Scotland. This species is apparently associated with calcareous conditions, occurring in grassland and woodland soil and leaf litter, beneath stones and occasionally in decaying wood. Notes: The European chernetid fauna is poorly understood, a point that has already been made. From the extensive survey of the family it has been considered appropriate to transfer this species from Allochernes to Pselaphochernes. Studies on the genitalia suggest that the original placement of this species was incorrect, as it is for several of the existing species of European chernetid pseudoscorpions (Legg 1987). 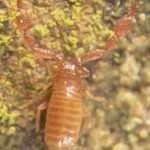 For more information see Mark Harvey, Pseudoscorpions of the World.